Some of the most interesting sights that I see as I am out and about are the everyday activities of other people. These are the things that seemed so foreign and unusual when I first came here. Now they seem a little more common place, but still fascinating. I love these sights. These are the things that remind me that I am lucky enough to live in Africa! Unfortunately, while driving is not the best time to take photos so I haven't shared a lot of these images on the blog. When driving I generally keep my purse and my cell phone in the boot (trunk) of my car so as not to entice any potential thieves. But in the name of good journalism I decided to keep my phone with me in the car for a bit, hidden under my leg, so that I could show you some of these things. The photos in this post were taken while stopped at red robots (red lights) or while out walking. Guys piled in the back of pick up trucks. 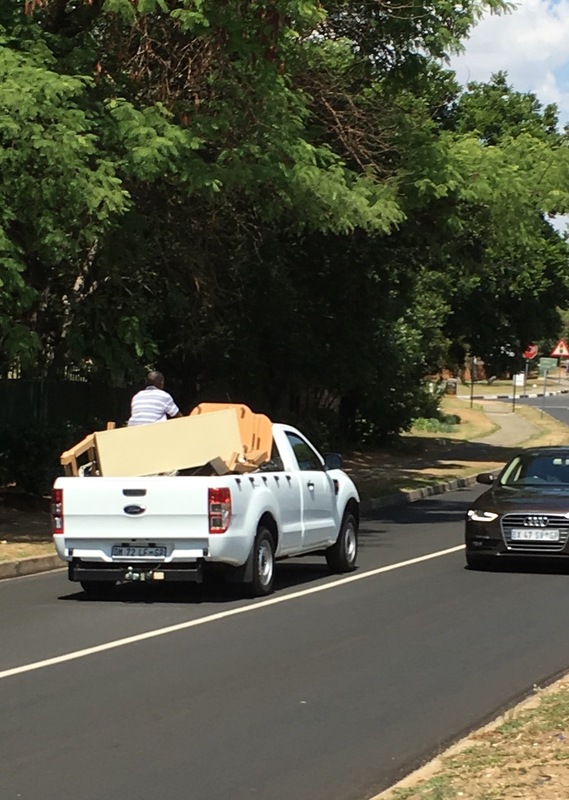 Pick up trucks here are called bakkies (pronounced buck ease or buck eee for a singular) and it is not unusual to see anywhere from 2 to 15 guys riding around in the back of one. This can be seen on roads around the neighborhood or on while on the highway. Sometimes it's just people in the back and other times people are squished in between piles of stuff. This one is a little different because it's within the complex where we live but still I had to post it. Holes. No, not potholes although there are plenty of those. I am talking about giant holes and trenches that are constantly being dug on the side of the road. Often the purpose of these holes is to do maintenance work on the water pipes. 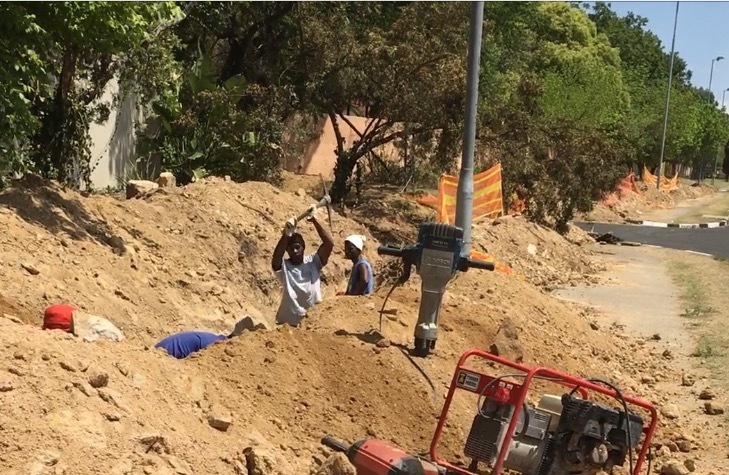 A high percentage of the time the digging causes a rupture in a pipe and then water starts pouring out into the street, sometimes for hours. Let's say you are driving near your house and you see water pouring into the street. You then know when you get home you will either have very low water pressure or no water at all. What's also interesting is that these holes and trenches are largely dug by hand by guys with shovels and pick axes. Rarely will you see any type of backhoe or machinery in use. Pick Axe! There is some kind of generator powered machine here but no one is using it. Women carrying packages on their heads or babies on their backs. While I see the guys in trucks and the holes every day, seeing a woman carrying something on her head is a little less common. I maybe only see it once or twice a week. I am amazed by this ability! 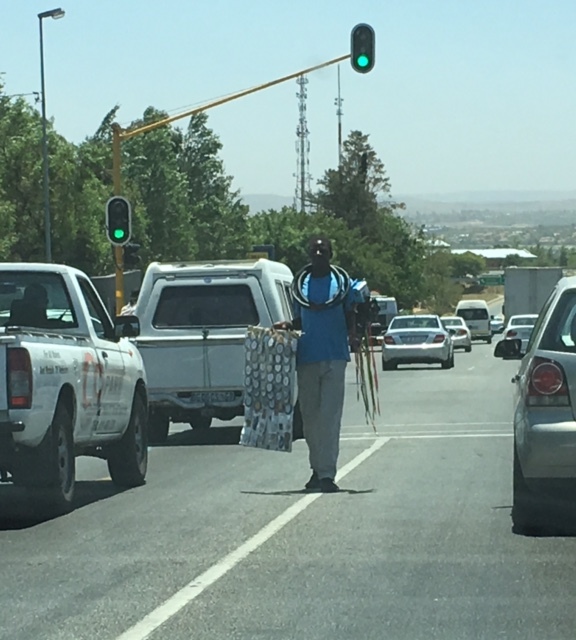 How can one balance a giant shopping bag or even suitcases on a head while walking? Sadly I couldn't get any pictures of a woman carrying something on her head for this post. I will keep trying! Baby with a blue hat. You can see his foot sticking out on the left side. 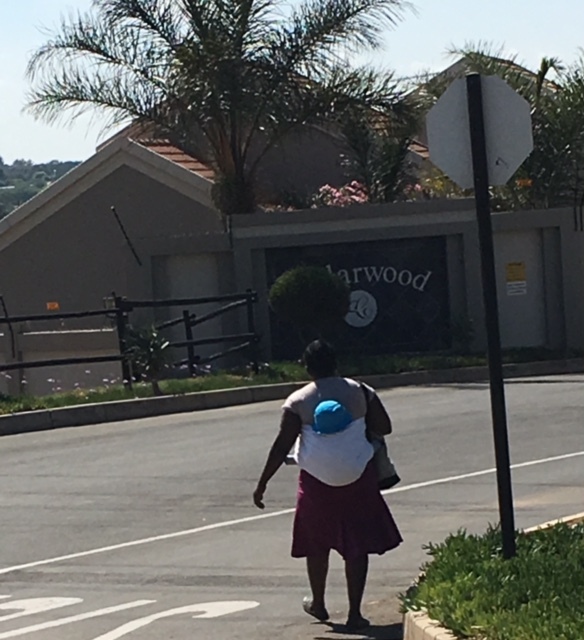 It is very common to see a woman carrying a baby on her back. The baby is held on by a blanket that is tied very tightly around the woman's front and the baby legs are on either side of the woman's torso. 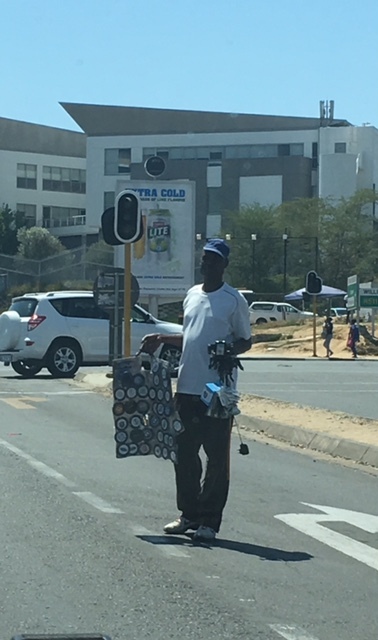 In addition to hawkers who sell items there are a large number whose job it is to try to hand out flyers at red lights. A lot of the flyers are for real estate, laundry services, pest control, and the like. Guy with flyers and you can see some paintings behind him that someone is selling. Selling cold drinks. Actually I have no idea if they are cold or not. Selling covers for your traffic registry registration that goes on the windscreen on the left side and cell phone chargers on the right side. People resting. When waiting for a ride, taking a break, eating lunch or just hanging out people may sit or lie down on the side of the road in the grass and if possible in the shade. Often times I think they might fall asleep for a bit. If I just spent a few hours digging a trench with a pick axe, I also might lay down for a rest! 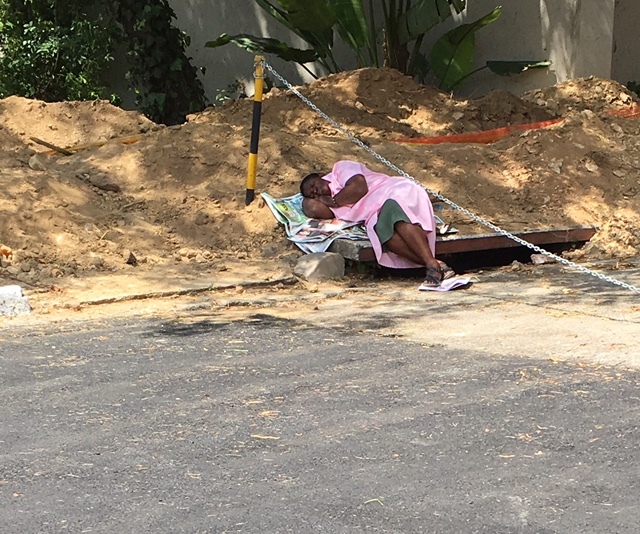 While it's mostly men who lie down on the side of the road (of course we all know how tiring it is to be a man), I got a picture of this woman laying down. She also happens to resting next to a giant hole! That's how many holes there are. Men under a tree. They are taking a break from work. Pedestrians everywhere. I wrote about this when we first arrived and now I understand it a bit better. People need to walk to work to and from where the mini bus taxi drops them off. Of course I have been in other places where people walk a lot but what is strange here is that there are so many pedestrians yet very few sidewalks or road shoulders. This leads to a lot of people walking in the grass or in the road. Outside of where we live they recently built a short sidewalk, not I don't think, out of concern for people's safety but to save the grass from being trampled. 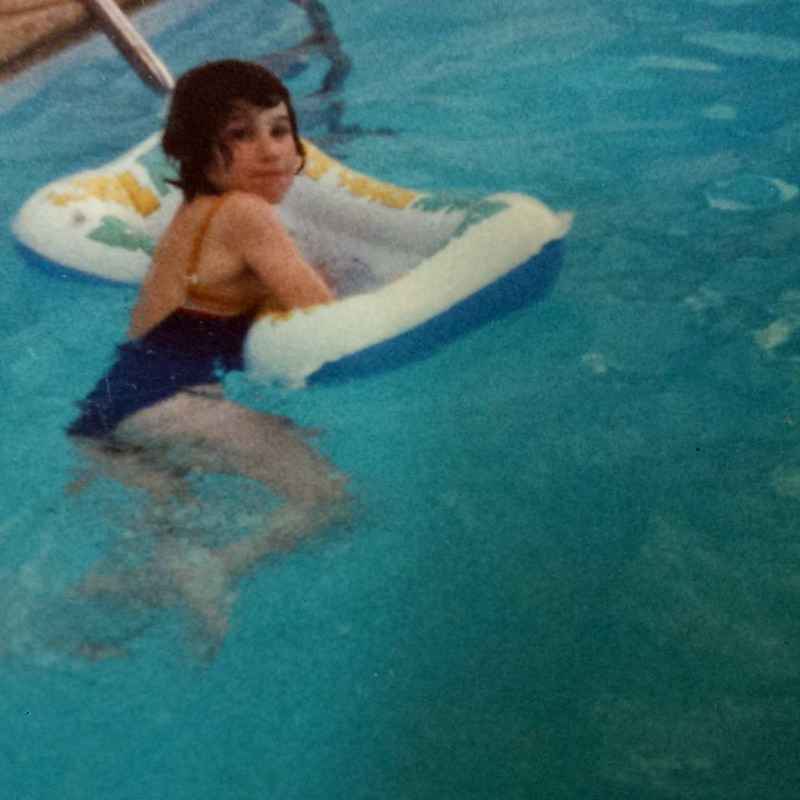 I loved this blog! Thank you for reminding me of all the things that were unusual when I first arrived and now seem so normal to me! By the way the drinks are cold - they usually have a cooler box hidden under the bushes where they have ice and cold sodas! I usually try to take the flyers that are being handed out at the traffic lights and bin them when I get home. 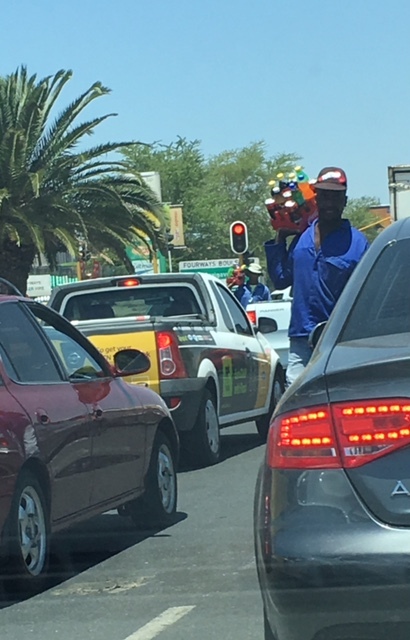 These guys don't get paid much to hand out the flyers and I think that if they manage to hand out flyers at least they are doing something! Great post!! All these are things I've written about. The pumice stones were the weirdest to me too. All the springbok jerseys we still have are from hawkers. I've always wondered if they we're official or fake. And yes, I'm one of those guilty of buying. Not just one but two cowboy hats off a hawker! You can read about it on joburg expat. I am pretty sure I know which hawker sold you hats. He is one persistent dude. If I were starting a company and needed to hire a salesman I would hire him in a minute. What caught my attention the most was the water pipe repairs. You would think that in a country with periodic water shortages they would shut off the water to limit wastage. Now I can see having it on initially to help identify a leak but beyond that it is horrible to waste water like that. I do know that wastage is a big problem in general. I read an article awhile back that rated the major metro areas in SA according to water loss via leaks or theft (how you steal water I don't know) and I believe that Durban had the worst rating with around 40% of the supply wasted. The pipe repairs I think are meant to update the infrastructure and limit leaks but it is true that still I will sometimes see major leaks and water pouring into the street. We are now living under water restriction regulations and may only water our gardens at night or early in the morning. The good news is that it has been raining regularly now in Joburg for a week or two so hopefully this pattern will continue for a while. Although RSA will always be a water scarce country.